Onboard Chaser Bin Scales for farming are available from eight Accuweigh branches across mainland states. This high quality range of Onboard Scales can provide accurate harvest data by individual paddocks which can then be exported to PC’s for full management reporting. Manufactured by Avery Weigh-Tronix in the UK, Avery’s Onboard Chaser Bin Scales are specifically designed for agriculture and farming needs using load cell technology integrated into the design of both the hitch and axle bars. These replacement components are simply fitted to the client’s chaser bin to form the basis of an accurate and extremely durable Onboard Weighing System that easily handles the rigours and stresses associated with is for being towed around paddocks. Chaser Bin Scales & Grain Cart Scales from Avery Weigh-Tronix provide accurate harvest data management by monitoring yield data and hybrid performance, providing proof of yields for crop insurance, preventing overloading of trucks, verifying your header yield monitor and much more. 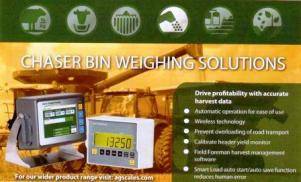 The digital weight indicators used in these Onboard Chaser Bin Scales are either chassis or cab mounted and can accumulate or store harvest totals for 100 fields with user assigned alphanumeric naming to identify each field in reports and data records. Accuweigh is Australia’s largest industrial weighing company and are proud sponsors of the Stock Feed Manufacturers’ Council of Australia (SFMCA) and the Australian Fodder Industry Association Ltd (AFIA).